One of my favorite things about being a food blogger for over a decade is seeing people I’ve met over the years do amazing things – like publish books! One of my long-time food blogger friends, Dan, from The Food in My Beard, just published an instant classic of a cookbook called The Comfort Food Mashup Cookbook. It actually comes out tomorrow but you can preorder it on Amazon! Dan has always been a master of the mashup recipe and so this cookbook is his bread and butter. SO many cool and creative recipes in it and you can guarantee that they are good. I had so many delicious things I wanted to make from the book that I did a quick poll in Instagram to see what I should make and you all chose Buffalo Chicken Pad Thai. Wise choice! The sauce alone for this recipe is pretty great. It’s very simple but I could see using it for all kinds of things (wings?!)! Get your mash-up on and try this fun pad thai recipe AND check out the bottom of this post for a chance to win a copy of The Comfort Food Mashup Cookbook! Mash-up recipes are some of my favorite and this Buffalo Chicken Pad Thai from The Comfort Food Mashup Cookbook! So yummy! Cook the rice noodles according to package. Drain and rinse them with cold water to prevent sticking. Bread the chicken: Add the flour, eggs, and panko to separate bowls and season the panko with a pinch of salt and pepper. 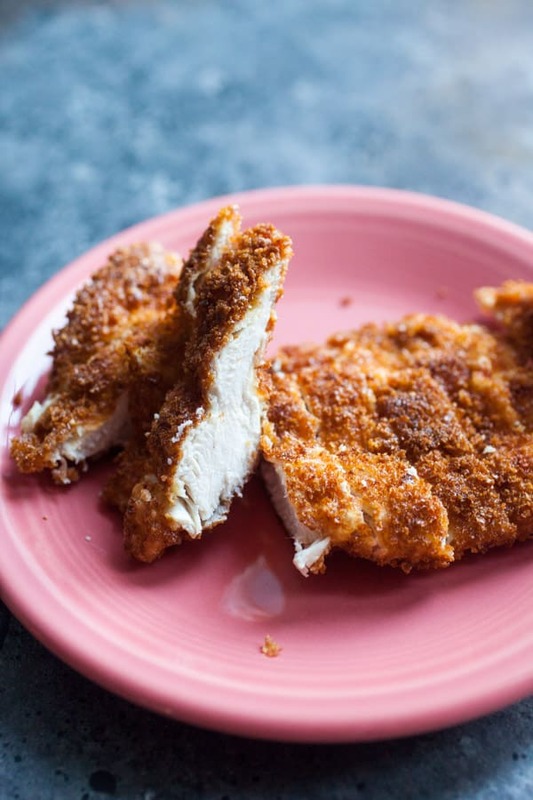 Cut chicken into thin strips or nugget shapes and dredge them in the flour, then the eggs, then the panko. Heat a thin layer of vegetable oil in a frying pan over medium heat. Once hot, pan-fry the chicken for about 10 minutes, flipping halfway through. Test to make sure the chicken is cooked through. Slice chicken into strips for serving. In a frying pan with a drizzle of oil, cook the carrots and celery on high heat for five minutes. Add the ginger and garlic and cook for another 1-2 minutes. Add scallions last and stir to combine. 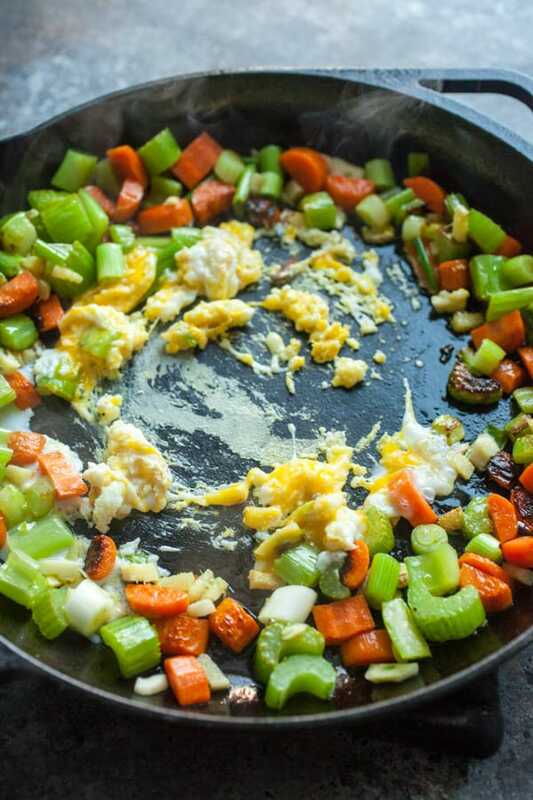 Spread veggies around the edge of the pan. Pour eggs in the center and scramble. 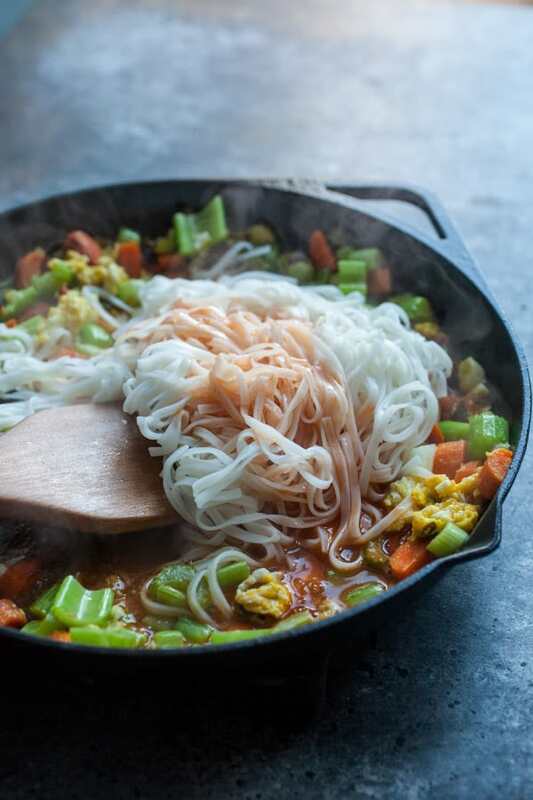 Once eggs are cooked, add noodles to the pan and stir to combine. Toss with sauce. 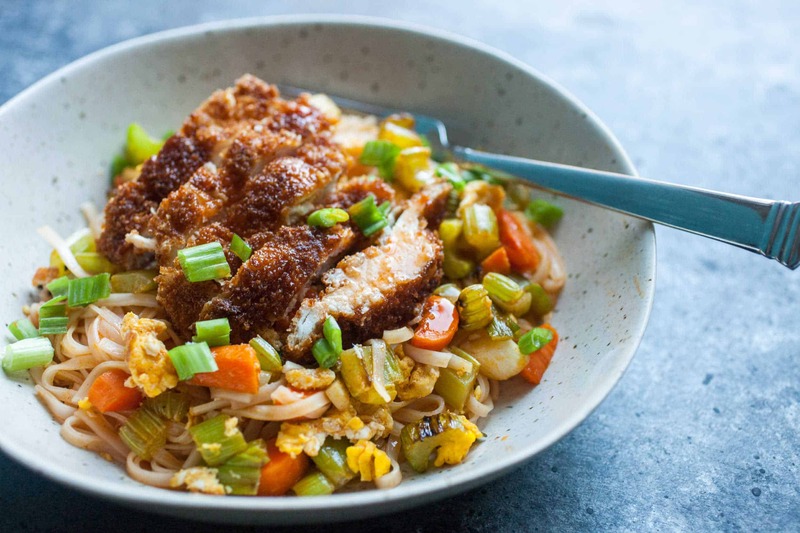 Divide pad thai between bowls and top with chicken. 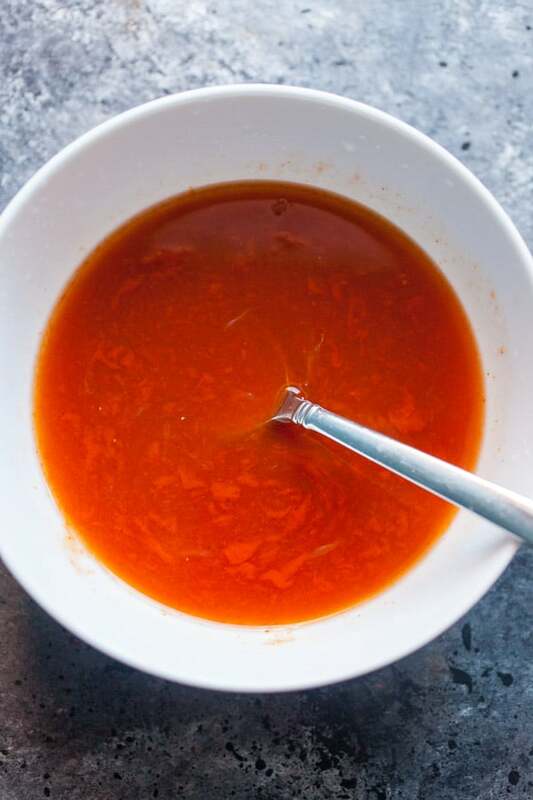 Drizzle with a little extra hot sauce and garnish with celery and carrots. This is the sauce. It’s half pad thai sauce and half wing sauce. I want it on everything. 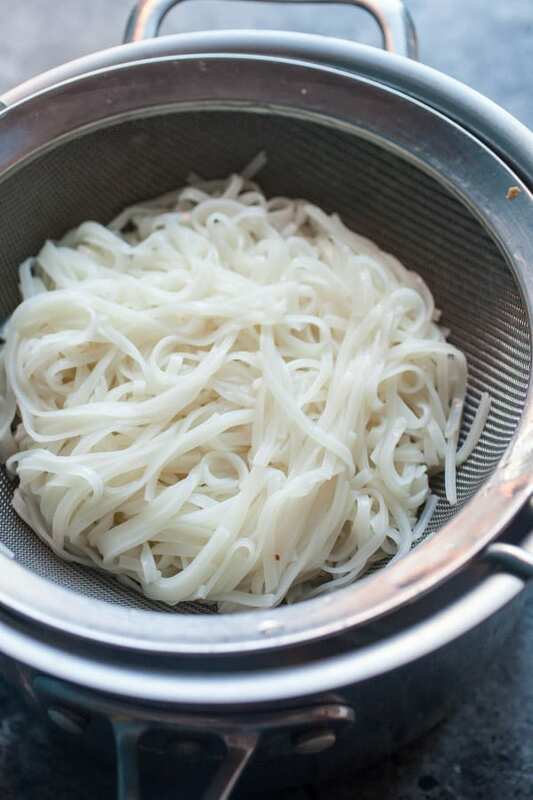 Cook your rice noodles and rinse them with cold water to prevent them from getting all sticky. Gummy noodles are the actual worst. The chicken for this recipe is pretty straightforward. 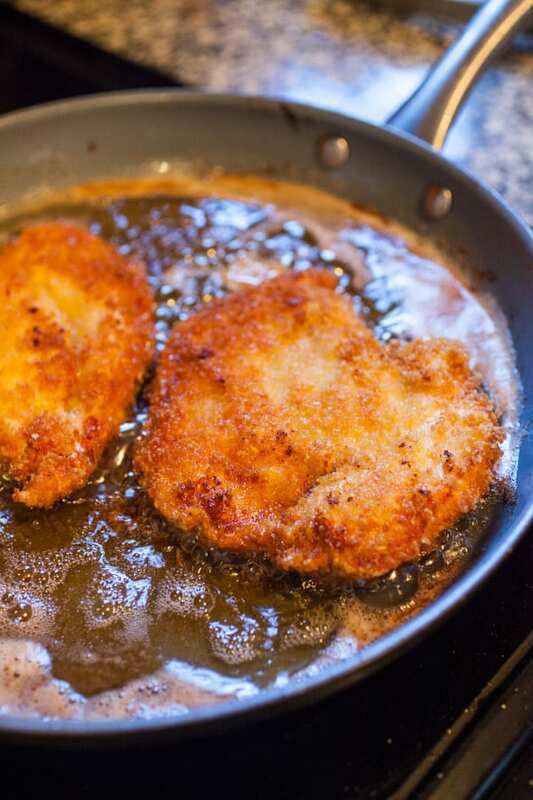 Take some cutlets and bread them in panko breadcrumbs and then pan fry them. Easy! My chicken came out very perfect. Dan recommends slicing up the chicken for easier mixing with the pad thai. I agree. The base for this pad thai is a lot of carrots and celery. Again – think wings here! The recipe in the book makes a bunch but this recipe is also very easy to make in smaller batches if you want to just feed one or two people. 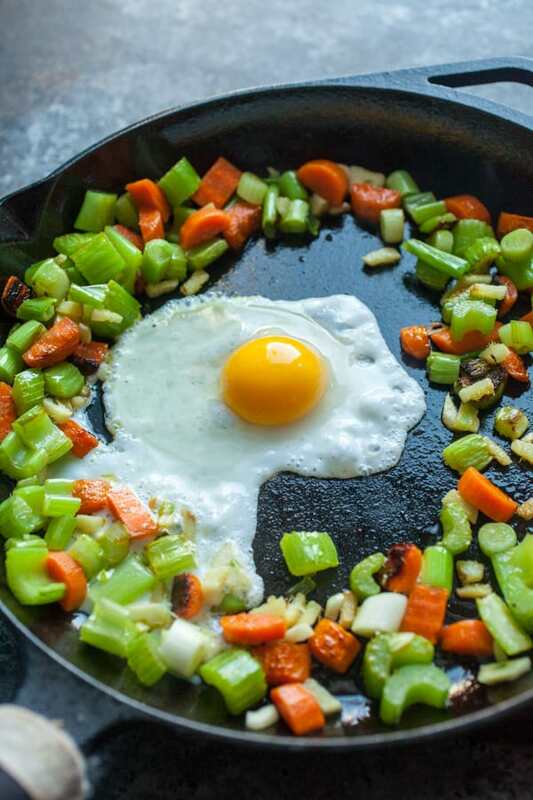 Once the veggies have sauteed for a few minutes, scoot them to the outside and add an egg. Classic pad thai. Kind of scramble it all together. You get it. Then add the noodles and the sauce. I reserved some sauce for serving. 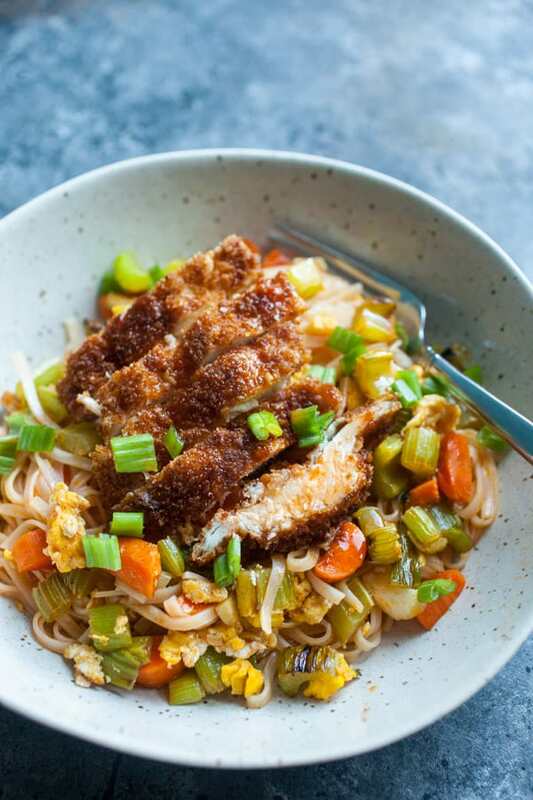 Serve up the buffalo chicken pad thai in bowls with some pan-fried chicken on top and some scallion garnish. Use the widget below (or just leave a comment on this post) to be entered to win a copy of The Comfort Food Mashup Cookbook! I’ll pick a winner next Wednesday (11/21). Here are a few other great spicy recipes! mac and cheese is probably my favorite comfort food – it can be so fast and easy, when you don’t want to have to think, or can be so elaborate and bubbly gooey crispy good… yum! We’d just eaten a cool recipe using Ramen noodles with a great stock,shrimp,scallion, mushroom ,garlic ,ginger…etc.. when I read this to my husband . He said.. definitely need to try that! Said our dish needed more heat…so there you go! Honestly…you just combined two of my favorite things together. Now I just have to convince someone else to make it and to serve me a drink, and my world is complete.